For more than a century, Arizona's 21 Native American tribes and nations have played an important role in the state's tourism industry. Postcard images of Southwestern tribes became the staple of an advertising campaign to promote the region to potential travelers beginning around 1900 and quickly became popular with visitors. Hundreds of images captured the beauty of the Native American peoples' homelands and villages, along with views of economic and domestic activities, craft arts, and religious aspects of the various communities. This book offers a wide-ranging overview of the vintage postcards that captured the visual essence of Native Americans in Arizona during the first half of the 20th century. 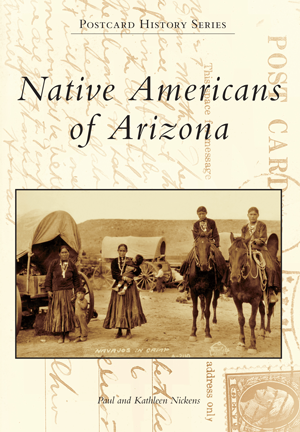 In this volume, authors and Tucson residents Paul and Kathleen Nickens utilized more than 225 postcard images from their personal collection and crafted accompanying narrative to illustrate the rich heritage that characterizes Arizona's diverse first inhabitants. While the character of many of the images depicted herein has changed somewhat over the years, visitors are still welcomed today in Arizona's Indian country.